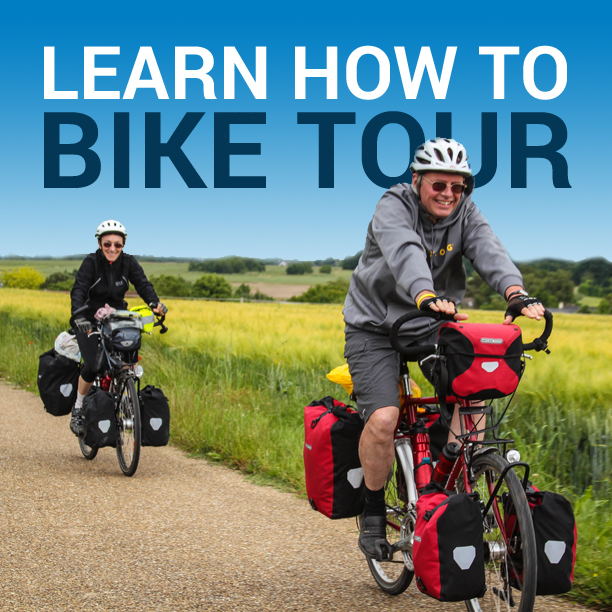 Being prepared for extreme weather is an essential part of making your bicycle tour a success. Much of being prepared for extreme weather conditions is about having the right clothing with you. Deciding what clothing to bring and what to leave at home is the tricky part. To determine what type of clothes you need to bring, you need to do a little research before you leave home. Find out how hot it might get during the day and how cool it may get at night. Once you’ve uncovered this information, go about getting clothes that are appropriate for these weather conditions. Below I have given a couple scenarios you might run into while out on the road and I’ve given you some suggestions on how you might deal with these extreme weather conditions. Rain is likely going to be the most common extreme weather condition you experience on your tour. Whether you are planning a summer or winter tour, you’re likely to encounter at least a little bit of rain. When a rain shower does find you, be sure that you’re carrying a good rain jacket and rain pants. I’ve found that the jacket is much more important than the pants, as I actually find it refreshing at times to ride in the rain with just my bicycle shorts. However, when it gets really bad, my pants go on in a jiffy! Most cyclists, myself included, keep their rain clothes buried in the bottom of their packs. This is fine, but you must be prepared to get grab these essential clothing items quickly if a storm does come your way. When a storm approaches you suddenly and you don’t want to stick it out and ride in the downpour, you can use the rain fly from your tent as a temporary shield against the rain. Remove the rain fly from your bag, throw it over your bicycle and climb underneath it. Your bicycle will act to hold the rain fly in place as you simply crouch underneath. It’s a fast and easy way to get out a rainstorm that seems to have come out of nowhere. In most cases, the hail you encounter on a bicycle tour will be small enough that it won’t pose a threat. But once these tiny ice balls become large enough that they start to hurt, make cover quickly. Find a building, tree, or bridge to hide under. If nothing is around, use the technique I describe above to use the rain fly from your tent as a temporary shelter from the storm. Hail is not something to be messed with. Keep your helmet on at all times and don’t get back on your bike until you’re sure the storm has passed. Even riding during the summer months does not totally prevent you from encountering a freak snowstorm. During a light snow, your normal raingear will do just fine, but when the storm gets rough you’ll need to take extra precautions. First of all, if you plan to be riding in snowy conditions, bring a snow jacket and snow pants with you. They make take up a large mount of space, but they’ll be worth having. You can ride in these clothes, but be careful not to get your pant leg stuck in the chain. A lightweight and compact facemask might also be a vital part of your gear. Wearing your glasses during a storm is also crucial, as this will keep the snow from getting in your eyes as you ride. Sometimes, even having the right clothing won’t be enough. If the storm gets real bad and you start to lose feeling in your hands, feet, or face, stop riding your bike and do one of the following two things. 1. Hitch a ride out of the storm. Be careful, but do whatever it takes to get yourself to a safe and warm environment. Or 2. Find a place to set up camp, get inside your tent, crawl inside your sleeping bag, and hunker down. Get warm, make some hot food and drink, and stay put until the storm passes. Riding in snow and ice can be extremely dangerous. Take extreme caution when on the bike, as both you and the vehicles around you may slide across the road. When possible, do not ride when snow is falling. Instead, wait until the storm passes and then continue your ride afterward. Riding in the wind is a bicyclist’s worst nightmare. Especially when the wind lasts for days and days on end. There are three things you must do when riding in extreme wind. The first thing you must do is eliminating any sort of drag you are creating with both yourself and your bike. Make sure your panniers are all tucked in, that you don’t have any flaps or strings hanging off the back of your bike, etc. Next, make your body as small as possible. Like the Tour de France racers, do whatever you can to make yourself a smaller object for the wind to fight against. Finally, put your head down and start pedaling. The trick for riding in the wind is to not tire yourself out. Put your head down, develop a good steady pace, and do your best not to think about how slowly you’re actually going. Riding in the wind will likely be one of the most mentally taxing parts of your bike tour. You need to be prepared for it though, as wind is likely to hit every touring cyclist at one point or another. If extreme wind seems to be blowing strong during the day and then dies down at night, you might consider sleeping during the day and doing your riding in the dark. Be warned: This technique should only be used in extreme situations. In most cases, it is not recommended that you do any sort of riding at night. If you do take this approach, make sure that you have working lights (both front and back). This strategy for beating the wind is best utilized by cyclists riding in pairs or groups. Riding alone in the night is not recommended (especially for those still afraid of the dark). Riding in extreme heat is another situation you may run into while out on the road. Just as dangerous as rain or snow, heat is something you’ll need to take precautions from. First of all, drink lots of water. There’s nothing worse than running out of water and getting dehydrated in the middle of nowhere. Finally, take advantage of the shade. When it’s extremely hot out, do your best to keep your body temperature down. You may be temped to use the water in your bottles and pour it over your head, but you’ll likely want to keep that water for drinking. If you are near a stream, lake, or ocean, jump in for a minute or two and then hop back on the bike. Be constantly on the lookout for ways to keep yourself cool. The last thing I want to say about riding in the heat is that you may run out of water very quickly. If this happens, do what you can to flag down a passing motorist and ask for water. Or if possible, find a house or building nearby and ask the occupants if you can have some of their water. Most people are more than happy to help. When the weather turns deadly, you need to get out! Do whatever it takes to get yourself out of the area and out of harms way. Call for help, take shelter, hitch a ride, whatever! If you have to, leave your bike behind. You can buy a new bicycle and get all new gear, but you’ve only got one life to live and it’s your life that’s most important. If you find yourself in a potentially deadly weather situation, there’s only one thing to do: get yourself to safety! This entry was posted in Bicycle Touring Pro Articles, Featured Articles, Featured How-To Articles, Main Articles, Safety, Videos and tagged bicycle touring, bicycle touring weater, bicycle travel, bicycling in the snow, bicycling weather, biking in the rain, biking in the snow, cycling in hail, extreme weather, hail, heat, hurricane, ice, rain, snow, sun, sunscree, tornado, traveling by bike. About 30 years ago, on an early summer group ride near Colorado Springs, we were ambushed by a fast moving cold front that arrived eight hours ahead of schedule. Suddenly, our fingerless gloves and light jerseys weren’t warm enough. The older and wiser members of the group stopped at a convenience store and came out with newspapers stuffed inside the front of their shirts and baggies to give their hands some wind protection. We all followed suit and completed the ride in relative comfort.